The following article is one of a series by Barnaby Hone exploring the issues surrounding POCA confiscation, enforcement and related topics. 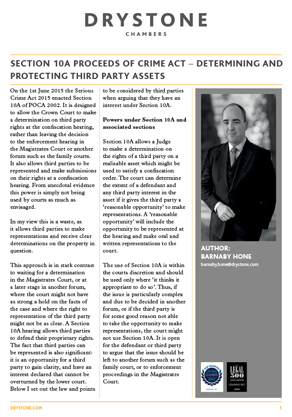 Following his previous article on the challenges facing prosecuting authorities face when enforcing orders, Barnaby turns to Section 10a POCA 2002 from the defence perspective and explores the impact and possible benefits of this section: in particular how it might be utilised to ensure third parties receive a clear determination from the Court with regards their interest in any seized property or asset. Barnaby has just returned from training prosecutors and judges from eight countries of the Horn of Africa in Anti-Money Laundering and Mutual Legal Assistance. Barnaby was selected as an expert to carry this training due to his expertise in International Financial Crime and POCA work.